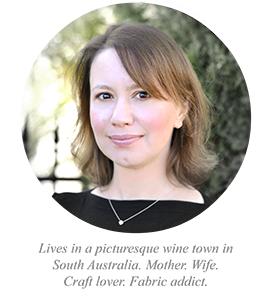 It must be the season for blog tours! I'm back again, this time to share some sweet makes from the new sewing title 'Sew Illustrated', by the fabulous duo Minki Kim and Kristin Esser. I distinctly remember when I first discovered Minki's incredible sewing 'art' on Instagram (her IG name is @zeriano). It was a revelation! I am calling it art as that's exactly what it is, it's art made with small, vibrant pieces of fabric and dark thread. I didn't even know if the technique had a name at the time, I have since learned that Minki refers to it as 'sewing illustration', I have also heard it called 'drawing with thread'. If you have a spare afternoon grab a cuppa and spend it browsing through these ladies' blogs: Minki's Work Table and Kristin's They Grow Up Too Fast. Sew much inspiration! Remember these? Minki was kind enough to make some projects with my fabric collection Sweet Orchard for my spring quilt market booth - she had the teeniest amount of fabric to work with (as did I) but managed to create a gorgeous mini quilt and the sweetest tags! Therefore I knew her technique worked well with the sweet colours of my line, so I used Sweet Orchard to make a coaster set, and a dessert mat. I had originally intended to just make the coasters, but I was enjoying myself so much I couldn't stop. I had admired Minki's dessert mats on her Instagram so I had to make one of those also! 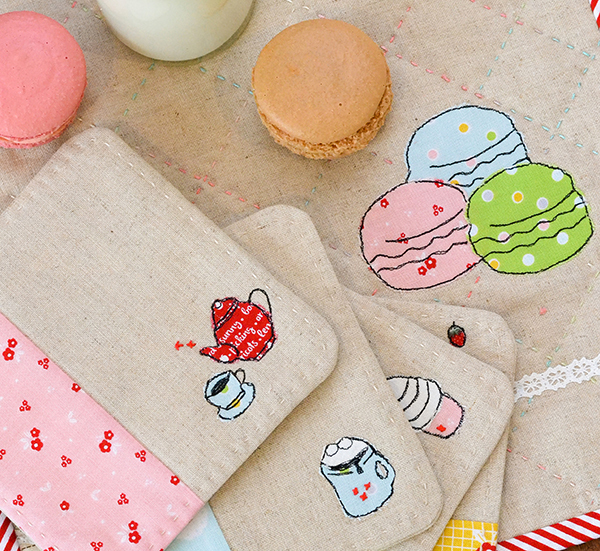 I did a bit of mixing and matching with the patterns - the macarons and some of the coaster drawings came from other projects in the book. That's one of the great things about this book though, it's so versatile. If you've never done sewing illustration before don't be intimidated, as there is a big (and very clearly explained) section at the front of the book about the techniques, the materials to be used to achieve best results, and lots of tips and tricks. Talking trade secret level stuff. So good! There is a really sweet story behind the book as well, and about how this fabulous duo met. You can read it here. And there you go! Thank you so much for visiting today. Here's a list of all the other stops on the tour, pop over to see what everyone else is making! Winner is Karen Caves - congratulations! 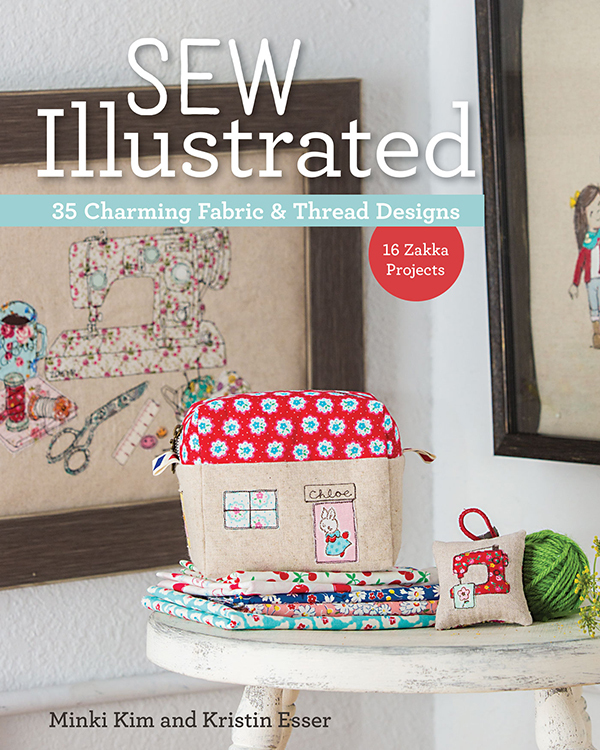 C & T Publishing are generously giving away a copy of Sew Illustrated at every stop on the blog tour. If the winner is in the USA, they will receive a hard copy of the book. If the winner is International, they will win an eBook. To enter just leave a comment below :) Giveaway is open World Wide. The winner will be notified by email (if one is available) and announced here on this post. Good Luck! I love the coasters. Is the coaster pattern in the book? This book intrigues me. It is so different from what I normally do. 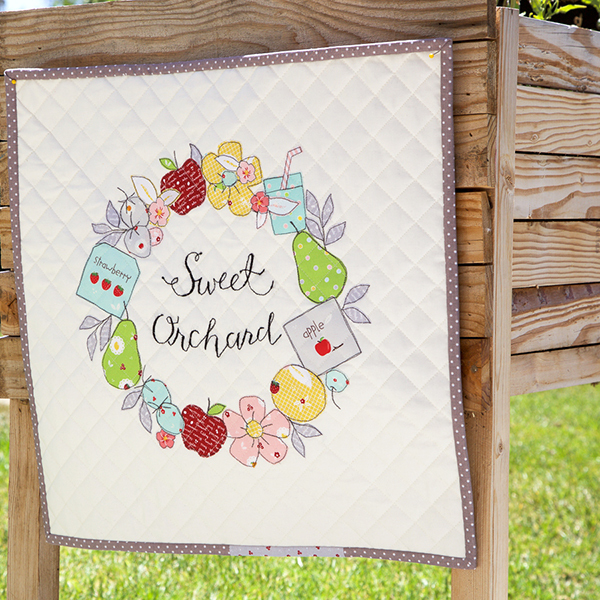 What a great duo - Sweet Orchard and Sew Illustrated. 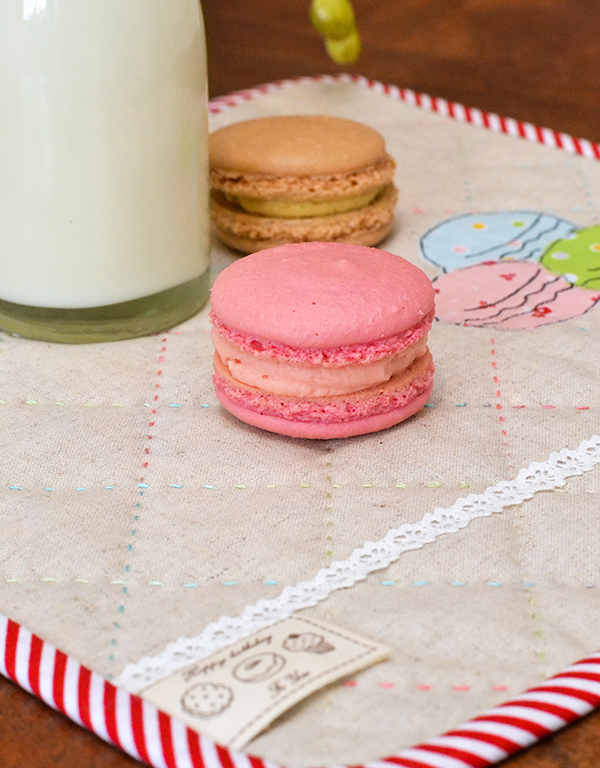 Love the dessert mat and your coasters. These are really cute designs. Very cute! I love the tags and the coasters! 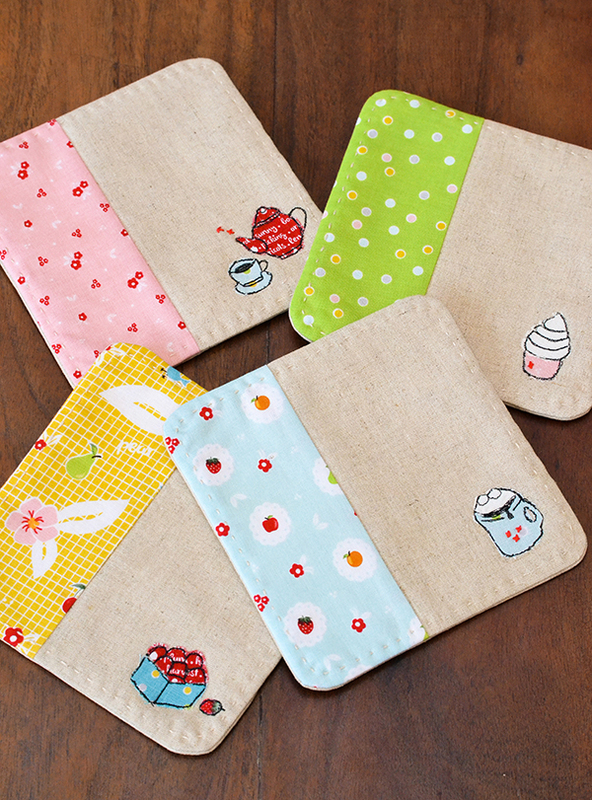 What beautiful, beautiful coasters and dessert mat!! 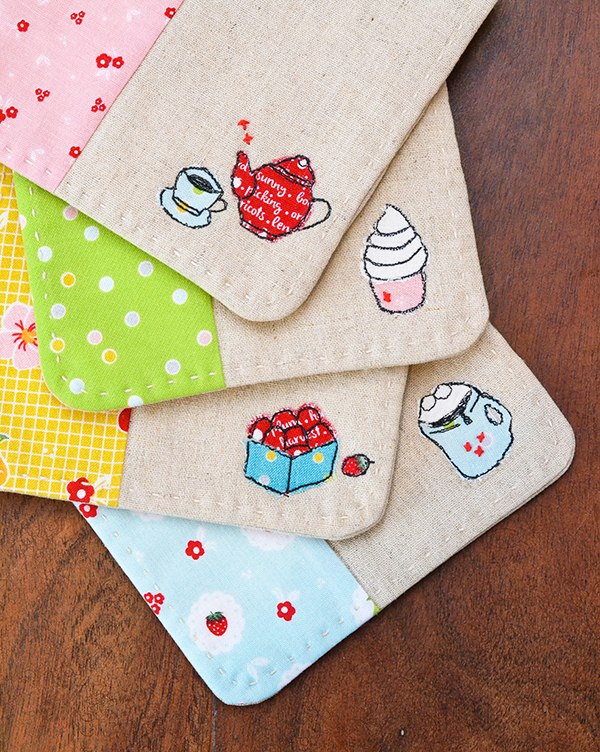 I'm always amazed at all the cute projects made with the fabric pieces. Wow, to the little illustrated art drawings on these projects. I just love your multicolor quilting on the mat! Is it variegated thread or just color changes? Beautiful, I am an artist, that is new to sewing, these fun projects in these great fabrics really inspire me! I think the Sew illustrated book is the best of both worlds. Pure sweetness : )!! Love them all!! Can't wait to get this book, looks so great! So sweet, can't wait to see the book. Just love these projects, they are all so sweet! What a great idea!!! I have loved seeing all the cute projects! thank you! I love the projects you made from this book! I follow Minki on IG and think her work is so beautiful, creative, and amazing. Thank you for the giveaway opportunity. 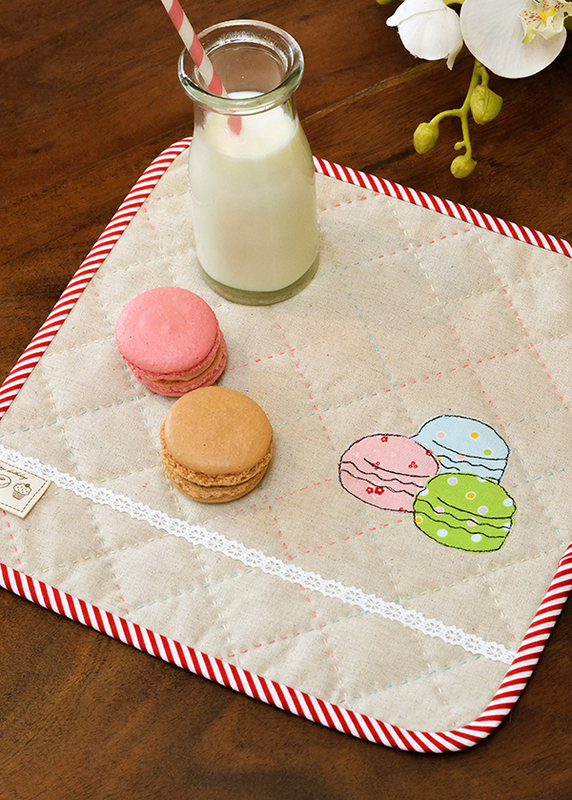 The macaroon dessert mat is so adorable! I love the variegated thread in the quilting! I'm about to get a freehand motion sewing machine so I think ill definitely need this book! Looks amazing!!!! LOVE all the cute projects from this book !! Can't wait to learn her technique! Waiting impatiently for the arrival of my order of Sweet Orchard. Such sweet tiny prints and I especially love the aqua/gray color combo! Oh amazing - so lovely. All of these are just gorgeous! Especially those strawberries! Everything you made is absolutely darling!! This book looks awesome!! 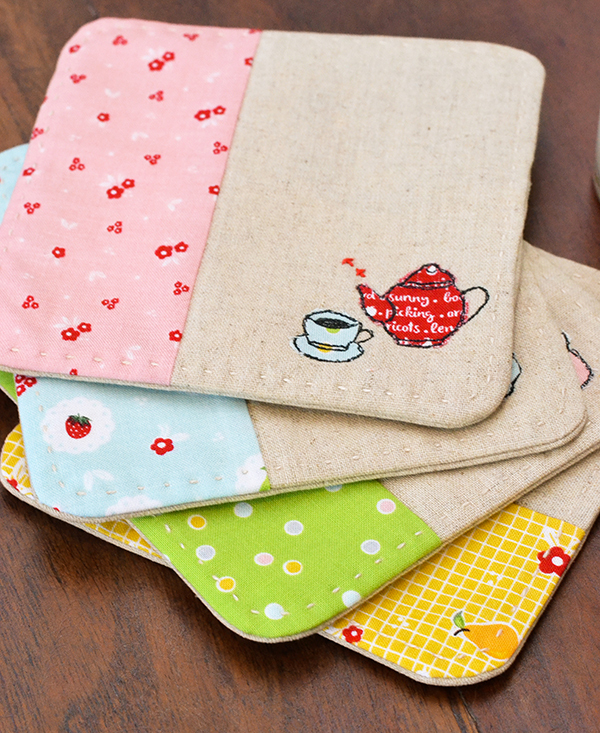 What a delightful book & your new fabric range is just perfect for these sweet, sweet patterns. Oh. Wow! What fun it would be to learn these techniques and have something else to occupy myself with. Lovely and gorgeous and fantastic!!! Thank you for the opportunity. These are sew cute! This book really has some cute projects in it. Thanks for sharing and for the giveaway. 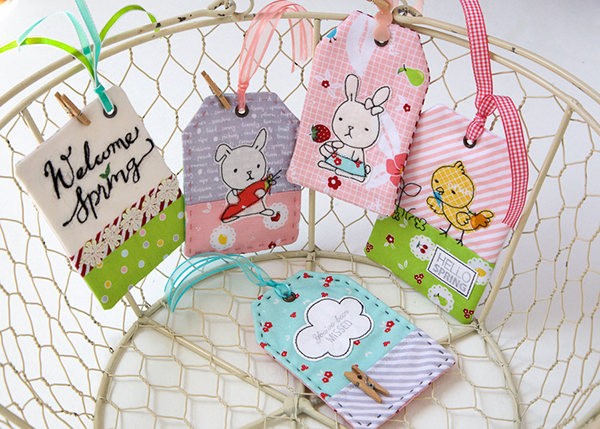 How perfect are your fabrics combined with Minkis creative ideas! I am so excited for this book. I absolutely love her work. Thanks for sharing! 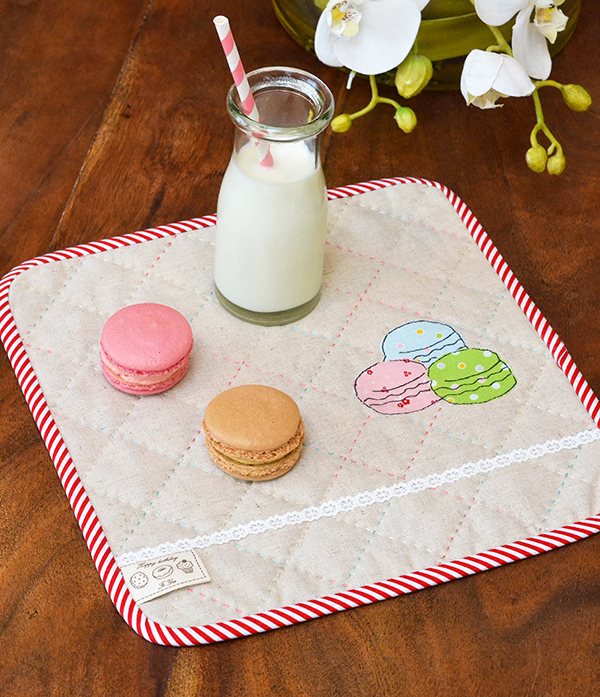 Your coaster set and dessert mat is just adorable! They would make a great gift set for a new neighbor or a bridal shower. I am really interested in this technique and the secrets! I would love to win such a lovely book!!! Thanks for sharing about the book! I've done a tiny bit of sewing illustration and the info on materials to use would be so helpful! I love the coasters. I know this book is amazing. Looks like such a fun book. I see lots of gifts. Wow - it's do lovely! Looks like a lovely book! I love the coaster - they look great. Oh the book looks terrific, thanks for the giveaway. Wow! I'm excited to discover I can combine my two favorites; drawing and sewing! My ADD (art deficit disorder)is now compounded! Love love love this new fabric line of yours and can't wait to stitch up all sorts of adorable projects from this book for my daughter. Your strawberry and ice cream coasters are so cute!!! Thank you for the giveaway. I love your projects. And I cannot wait for a chance to read and try this technique on some appliqué pieces. Thanks for sharing and encouraging us to try a new technique. 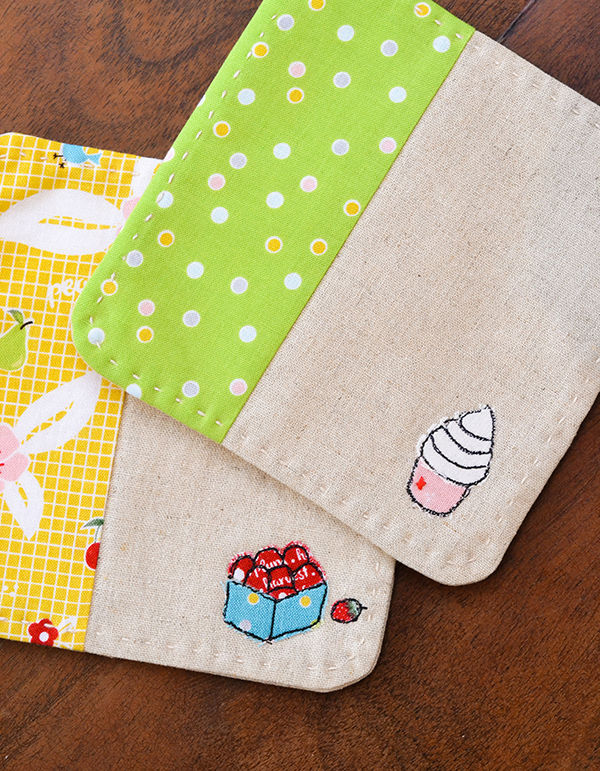 Love the dessert mat and coasters you made and your fabric! Well done! Such darling projects! I'd love to have this book! LUV your coasters! What I cannot figure you is how to iron transfers the designs as noted on page 6 when they are printed on both sides of the tear sheet! Any help? Thanks! Hi Cat, I suggest you contact the authors directly as I am not quite sure how they recommend to do that.. 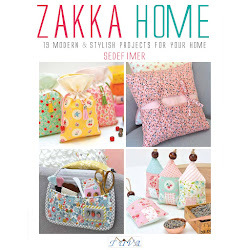 I always love zakka craft projects.. Love to win the book. LOVE LOVE LOVE the projects I am seeing! Do you have to drop your feed dogs for this technique? Susan only if you use a darning / open toe foot and do it free motion. I just use a regular zigzag foot so I don't drop mine. The wreath looks fun in your fabrics. I would love to learn how to do this from their book. 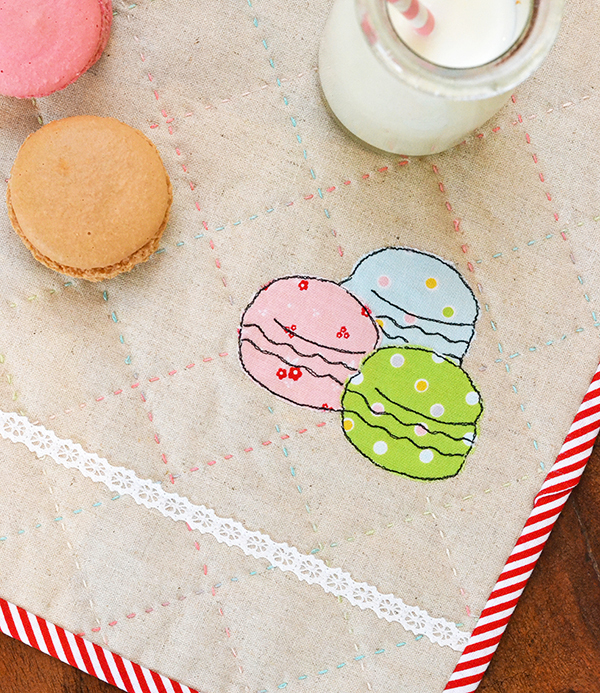 Loving this blog hop, and all the cute projects! Such cute projects. Thanks for the giveaway. Love the projects I've seen from the book. Your fabric line compliments these project perfectly. Adorava ser a feliz contemplada! Love the little tea and cup!! and everything else! All is so adorable!!! Lovely blog tour! I know nothing about sewing but would love to start! Great projects! Thank you for the chance to win. What fun! Love your color combinations! I would love to win! Your projects turned out so precious. Everything is beautiful! Such sweet sewing illustrations. I am keeping my fingers crossed that I might win a copy of this book. How I would love to make some items from this book with your Orchard fabric. I love it...especially the strawberries!!!! What sweet projects! Thanks for the inspiration. So many pretty things! You inspire me. Thank you! 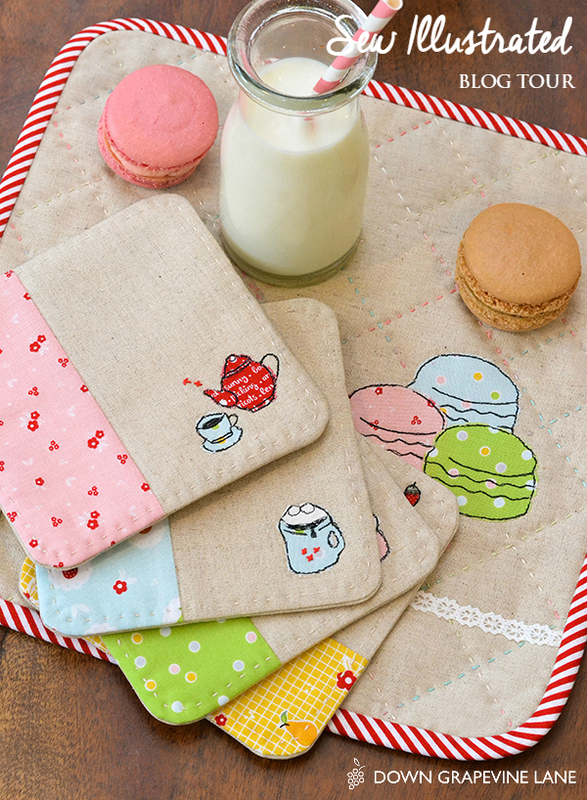 Your dessert mat and coasters are so cute! What gorgeous projects! The macaroons! Looks like a great book! I especially love the tags. *** GIVEAWAY IS CLOSED *** Winner is Karen Caves! Congratulations!! The coasters are so cute...!